1. Regularly check that the gate latches securely and that spring mechanisms work properly. Regularly oil the hinges and latches. 2. Don’t allow children to play in the pool area.Remove all toys, tricycles – anything a child might want to get – fromthe vicinity. 3. Post CPR instructions and the 911 emergency number in the pool area. 4. 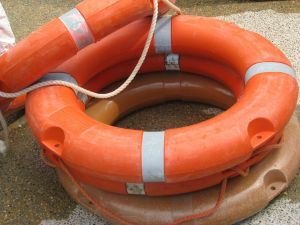 Keep lifesaving equipment, such as a pole, lifepreserver and rope – in the pool area. Hang them from the fence sopeople won’t trip on them. 5. Have a phone handy to the pool area. Do not answerthe phone while your children are in the pool; use the phone only tocall 911 should a problem occur.